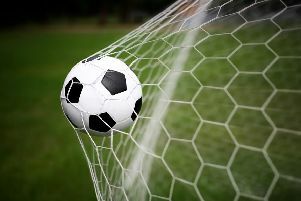 Hastings United Football Club produced its best performance of the season to record its biggest win of the campaign on Easter Monday. Davide Rodari plundered a four-goal salvo as Hastings pulled off a crushing 7-1 victory away to East Grinstead Town in Bostik League Division One South. Ollie Rowe, Sonny Dullaway and Dayshonne Golding were also on target as Hastings moved up a place to ninth in the table after making it 10 points from a possible 12. It was a bit touch and go as to whether the game would be played as the pitch was pretty wet following all the recent rain, but both managers were happy to go ahead. Hastings started well and dominated possession, but weren’t doing a great deal with it until being gifted the lead midway through the first half. Grinstead goalkeeper Dan Smith miskicked straight to Rodari, who duly rounded him and slotted into the corner of the net. The visitors seemed more confident going forward after that and started to apply a bit more pressure. After several good attacks, Jack Dixon swung in a corner which Grinstead failed to clear and Rodari stabbed home his second from six yards. Grinstead came into the game a bit during the latter part of the first half and caused a few problems, forcing Hastings to clear from near their goal-line on one occasion. A heavy downpour late in the first half thankfully abated at half time and the second period was played out in persistent drizzle. The game was held up briefly while the referee removed a dead rat from the pitch, to the amusement of many in the crowd. Hastings upped the pace and the floodgates opened as they produced some lightning quick one-touch football, with Grinstead unable to get near them. The away side netted five times in a devastating 20-minute blitz, starting on the hour when Rodari pounced to complete his hat-trick after Golding’s shot was blocked. Rowe headed home from a 69th minute corner to make it 4-0 before Dullaway scored probably the pick of the bunch with his first contribution after coming on as a substitute. The teenage prospect was put through on the right, shimmied past a defender and launched a tremendous shot from the corner of the area over the goalkeeper’s head into the net. Golding, who was a nightmare for the Grinstead defence all afternoon, got the goal he deserved to make it 6-0 in the 75th minute. Golding found himself in space in the right-hand side of the area and blasted into the top corner from a tight angle. Hastings weren’t done there and Rodari, who never stopped running, bagged his fourth of the afternoon six minutes later when he rounded the goalkeeper having been put through by Ansu Janneh. Hastings had other chances to have added to their tally still further, but Grinstead nabbed an added time consolation when Stephane Bombelenga’s shot from the edge of the area took a wicked deflection which gave Hastings goalkeeper Charlie Horlock no chance. Buoyed by some good support from the travelling faithful, every Hastings player put in a fantastic performance. The defence was solid and looked assured, the midfield ran the game, and the difficult surface seemed to suit Hastings as the ball zipped across it. Hastings: Horlock, Rowe (Fielding), Beale, Lovatt (Dullaway 71), Christie, Cruttwell, Rodari, Dixon, Walker (Kieran 75), Janneh, Golding. Subs not used: Climpson, Pritchard. Attendance: 124. Bostik League Division One South top half (played-points): 1 Lewes 41-89, 2 Carshalton Athletic 40-87, 3 Greenwich Borough 41-83, 4 Cray Wanderers 42-82, 5 Corinthian-Casuals 41-82, 6 Walton Casuals 41-77, 7 Hythe Town 41-73, 8 Whyteleafe 41-66, 9 HASTINGS UNITED 41-63, 10 Phoenix Sports 42-62, 11 Herne Bay 39-57, 12 Thamesmead Town 39-55.